All four pigs got out. Ted was gone for work, and when I went to feed them, they weren’t there. I kept looking for them, thinking they were sound asleep in a pig pile, and then I was looking at the yard, thinking, “What did those dogs do NOW?? 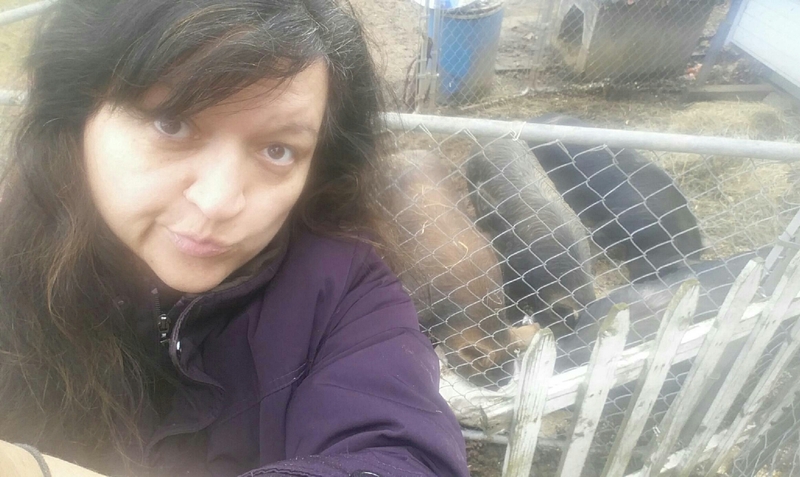 ?” Then I realized the pigs pushed out from under the fence and rooted up the yard in that area! I yelled for Sahara to go down the road and start looking in yards for them, and I asked Gamma to do the same going the opposite direction on the road, and I headed up the hill because their tracks were going that way in the mud. I called the sheriff to ask if anyone had reported pigs loose on our road and left my number in case they did. One neighbor saw the and yelled at the pig who ran back toward home, and a minute later another neighbor called to say her husband saw them in the woods and they were heading toward home. As I hung up, the naughty pigs came barreling out of the brush into the driveway and the yard. They were home, but that’s where the real adventure began: they would NOT go back in their pasture! They’d had a taste of wide open freedom and didn’t want to give that up! We grabbed the scrap bucket, some eggs, the chicken feed, and loaves of bread to try to lure them back in there. Mo (he’s so laid back…I do love Mo who just goes with the flow and is soooo fat!) went in to get the scraps, but none of the other three would go through the gate. I bumped them, yelled at them, and tried my best to scare them through it, but nothing worked. Gramma yelled at them and waved her cane in the air when they went near the sidewalk to try to keep them in the yard. Sahara made a trail of corn into the pasture, and they’d eat it up to the gate but wouldn’t go through. Finally, I poured a pile of feed into the dog kennel area, and we got two of the three in there. Sahara and I moved the kennel panel, effectively closing them up after MO wandered in to see what they were doing, and we had all three corraled, but Eeny (the only girl) had discovered the open garage door and the stored pig feed bags, and she wasn’t budging! Sahara lured her to the kennel by dragging a slightly torn feed bag, dropping little bites out its tear, to the kennel and tossing it in. We opened the kennel gate, and Eeny went in, and all four were caught! Unfortunately, the pigs are BIG, and Meanie simply started lifting the bottom of the kennel with his snout to try to get out, and he taught the others how to do it in a matter of minutes! I’d yell or smack the kennel, and they’d stop – for a minute. I couldnt leave them. I sent Sahara to Tractor Supply to buy tposts and chain with the thought that I could tie the kennel to tposts long enough to get the fence fixed, but it didn’t work. The kennel chain slid up the posts, and they would almost escape again. I couldn’t go more than a foot from the kennel, or they were at it again. Sahara had a great idea to drive the posts in at a 45 degree angle to anchor the kennel down, but because we were near the gas line and weren’t sure where it was underground, we could only anchor three spots so I still had to stay there to keep them from getting back out. Ted was over four hours away for work…it felt like a lost cause. Thankfully, I got ahold of Isaiah who said he’d come right over and help me. He found the problem with the electric fence (charger) and re-ran the wire, running two strands this time to deter them better from rooting under the fence. Dad went to Tractor Supply for me and bought a new charger and a couple of other fencing supplies, and Isaiah fixed it all, ran the pigs back into their now escape proof pasture, and I could finally go inside to get warm. That all sounds like it happened fairly quickly, doesn’t it? It didn’t. IT TOOK SIX HOURS AND TEN MINUTES. I stood outside in the rain, then ice and snow, and cold COLD weather for SIX HOURS AND TEN MINUTES. I didn’t truly get warm again until the next night (over 24 hours later)! The pigs have stayed inside the pasture now, and hopefully there will be no more escapes this time. I’m pretty sure Martha doesn’t have to deal with things like escaping pigs! I’m telling you…our farm could be a reality show. If those Duck Dynasty guys can get millionsof viewers, I KNOW we can, too!